Product prices and availability are accurate as of 2019-04-20 22:55:11 UTC and are subject to change. Any price and availability information displayed on http://www.amazon.com/ at the time of purchase will apply to the purchase of this product. 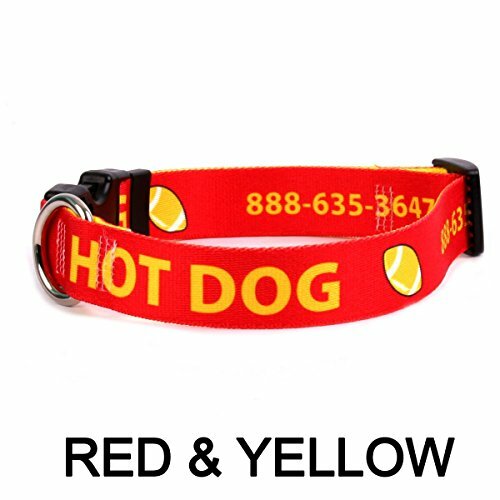 This is a fully Personalized Dog Collar from Yellow Dog Design, made right here in the USA. 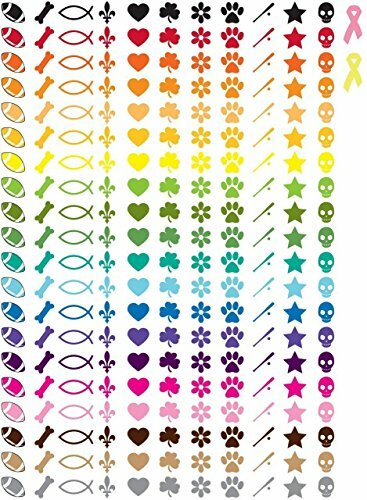 Available in LOTS of great colors including Red, Orange, Pumpkin, Peach, Goldenrod, Yellow, Spring Green, Olive Green, Kelly Green, Teal, Light Blue, Royal Blue, Purple, Plum, Magenta, Light Pink, Brown, Tan, Heather Gray, Black, and White. EASY ON EASY OFF - Using a quick release clasp, the collar can easily be taken on or off the dog. Don't worry though, opposable thumbs are necessary to activate the quick release. 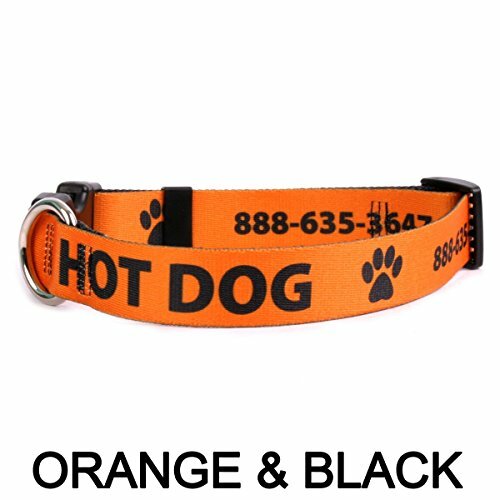 SIZING: This dog collar utilizes a quick clasp closure, also called a side release clasp. Sizing is given as a range of neck lengths. Measure your dogs neck size or its current collar length (not including buckles) to obtain correct sizing.Small (10" to 14" long x 3/4" wide). Narrow Medium (14" to 20" long x 3/4" wide). Wide Medium 1" (14" to 20" long x 1" wide). Large (18" to 28" long x 1"wide). To determine the size your dog needs, the easiest way is to measure their current collar. If you think you've seen personalized dog collars before, you haven't seen these! 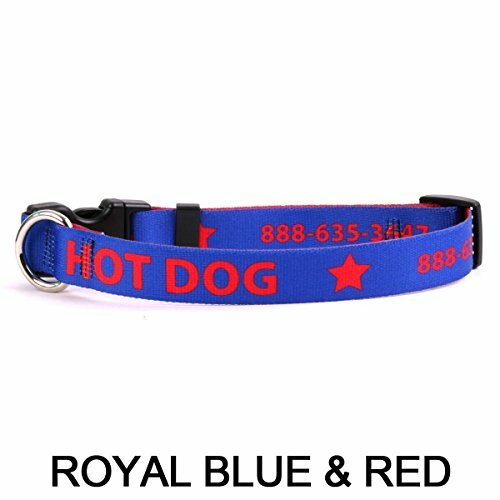 So much better than an embroidered dog collar, give it a shot and we're confident you will agree. 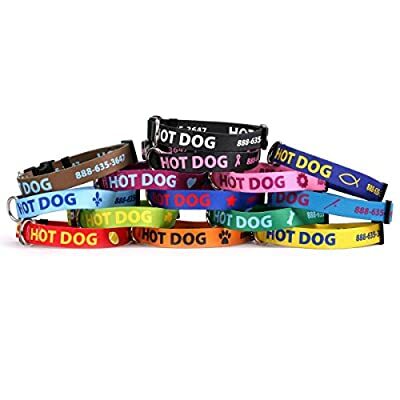 No rough edges, no embroidered threads to fray or break, no problem going in the wash, just smooth, hi-def customization on a soft wearable dog collar. 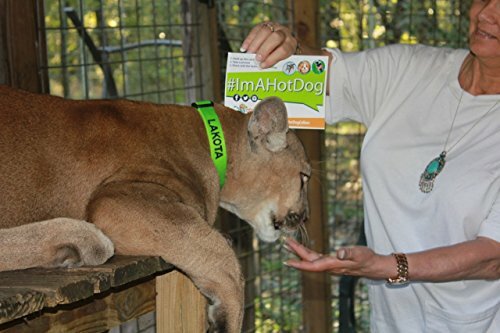 Hot Dog Collars is the place to personalize your pet. In business for over 12 years, we know pets and we know personalization. Most importantly, we know and love our customers. If something goes wrong (rare, but it happens) you can count on us to make it right!